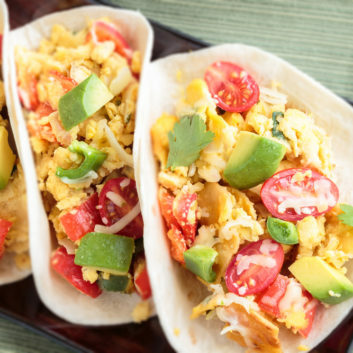 Use scrambled eggs as your taco stuffer to put a breakfast spin on this dinner favorite. Coat a large skillet with oil spray and preheat over medium-low heat. In a large bowl, whip together the whole eggs and egg whites. Add the eggs to the skillet and scramble until cooked through. Heat the beans on the stove or in the microwave until warm. To warm the tortillas, heat an ungreased skillet over medium-high heat. Add one tortilla to the skillet. Warm for about 10 to 15 seconds, then flip the tortilla using a pair of tongs and heat for another 10 to 15 seconds. Continue until all of the tortillas have been warmed. Top each corn tortilla with scrambled egg, 2 tablespoons beans, 2 tablespoons cheese, and additional toppings as desired.